Jose Mourinho is hopeful the Belgian midfielder will extend his stay and the club have no plans to sell him in January. Fellaini has been with United since 2013. MANCHESTER UNITED ARE still hopeful Marouane Fellaini will sign a new contract before the season is out and will not consider a January sale, despite the Belgian rejecting an improved deal. 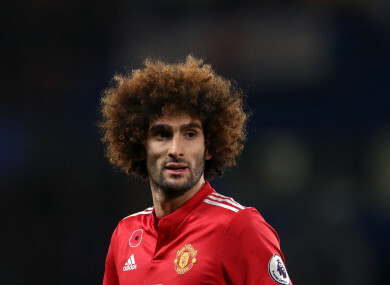 Fellaini’s current contract at Old Trafford is set to expire in June, and it has been revealed that the midfielder recently turned down a new deal during ongoing talks over his United future. If the 29-year-old does not come to an agreement with the Red Devils he could become available to other clubs as early as 1 January on pre-contract terms ahead of a free transfer in the summer. However, United have far from given up hope of persuading Fellaini to commit to an extension with the club he joined in the summer of 2013. The much-maligned former Everton man has become a more frequent member of the United first team under Jose Mourinho, with the Portuguese manager having entrusted Fellaini with increased game time since taking the helm from Louis van Gaal in 2016. In total, 56 of Fellaini’s 142 United appearances have come in the 15 months since Mourinho took charge and the manager has been a staunch supporter of the Belgian amid much conjecture from supporters and critics. Now Mourinho is adamant he will not give up hope of Fellaini staying beyond the end of the 2017-18 campaign, with pressure likely to be put on the club’s decision-makers to ensure the midfielder isn’t allowed to walk away without a fight. Whatever happens in the continued negotiations with Fellaini, United are insistent they will not sell the player in January despite the potential of missing out on a transfer fee which such a stance would present. Email “Man United may lose Fellaini on a free this summer after he turned down a new deal ”. Feedback on “Man United may lose Fellaini on a free this summer after he turned down a new deal ”.